I’ve been seeing advertisements for Grove Collaborative on Instagram for probably 2 or 3 years now, and several of my friends have been using their products, so I decided to just take the plunge and give it a try. What is Grove Collaborative? It’s a company that offers non-toxic, ingredient-transparent, plant-based, cruelty-free, cleaning and personal care products. Some items are their own brand, and others are with partner companies that follow the same principles, have ethical supply chains, and use sustainable materials. All of the products do a great job cleaning and they smell amaaaaaazing. They also carbon-offset every shipment – how cool is that! I used a referral link from a friend like this one, which gave her $10 off her next order, plus I got a ton of free stuff in my order, all of which I was able to select the scents for. Oh and those of you who are sensitive to fragrance – there are plenty of unscented options, too. So here’s my order – more than half of it was free, and I got free shipping, too! I put purple stars next to my 3 favorite items from the order. My #1 fave is the Caldrea Linen & Room Spray in Sea Salt Neroli scent, it smells soooooo gooooood! I plan to order lots more of the Caldarea products in that same scent, because I just love it so much that I want to bathe in it, wash my laundry in it, spray my counters with it, etc. etc. – you get the idea. 😉 The Mrs. Meyers Lemon Verbena scent is nice too – who knew washing dishes could be so fun, haha! All in all I’m very pleased with the order. I find myself cleaning more often now that I have the fun new products to use! The only thing I wasn’t completely thrilled with was the Mrs. Meyers Lavendar scented hand soap and lotion. The smell isn’t horrible, but it’s just… weird. Not the lavendar I’m used to. I’ve sent an email to the company asking to exchange them for “Rain Water” scent, and I fully expect them to do the exchange with no problem. Return anything, at any time, for any reason. We’ll send you a pre-paid shipping label. There is never any commitment. You can cancel anytime, or delay shipments as long as you’d like. We’ll be easy to reach via email, live chat on our website, or via the phone. You’ll always hear back from us within 24 hours, and almost always much, much faster than that. We’re so sorry you didn’t like the Lavender scent. I’ve added the Mrs. Meyers Hand Lotion and Hand Soap for free to your cart so they will ship with your next order. As a certified B corporation with a strong focus on sustainability, we try to avoid shipping and transit for small items and prefer to do what we can to consolidate items and shipments whenever possible. Thank you so much for your understanding! So they let me keep the lavendar (which I’ll probably gift to a boat neighbor) AND they put the rain water scent in my cart at no charge! I’d say that’s pretty excellent customer service! MAN I love this company! I’d like to note that a lot of these products (maybe all except the Grove brand?) are available in stores, but the prices on Grove’s site seem to be slightly better than other places from what I’ve seen. Especially the Caldrea products. 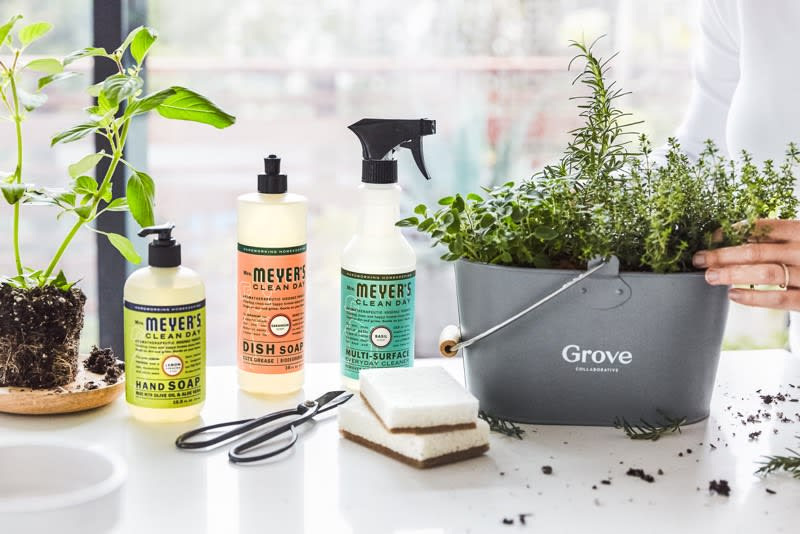 Mrs. Meyers is widely available but they launch exclusive scents with Grove, which is kind of cool. I didn’t do a ton of price comparison research, but I did check Amazon for a few items and Grove’s prices beat amazon every time. When you place your first order they set you up with an auto-ship schedule, but this is NOT required. I turned the auto-ship feature off and will only order items as needed. If you keep auto-ship on you can adjust the frequency anywhere from monthly to every 6 months, and you have full control of the order contents. The first order comes with a free 60-day VIP membership, which includes lower thresholds for free shipping and they’ll send you free items 4 times a year. The cost for the VIP membership is $20/year, and this too is optional (you can still order without being a VIP member). I haven’t decided whether or not I’ll pay for the VIP membership yet – I need to do more research on what it includes and decide if $20 is “worth it” for me. That only equates to $1.67/month, but still – every penny counts! 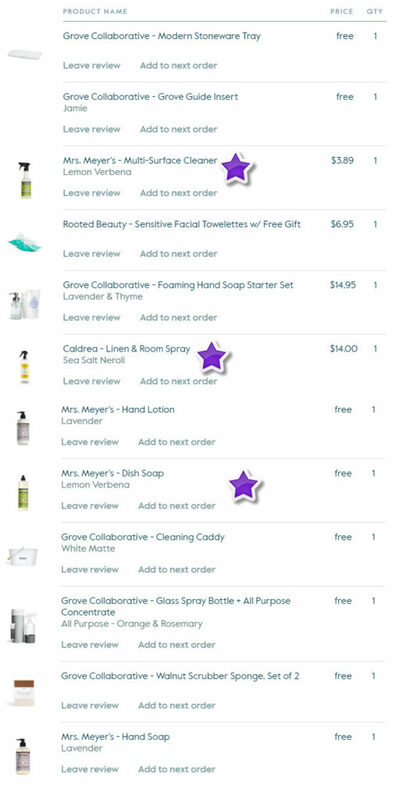 Free goodies – I love the Grove cleaning caddy! 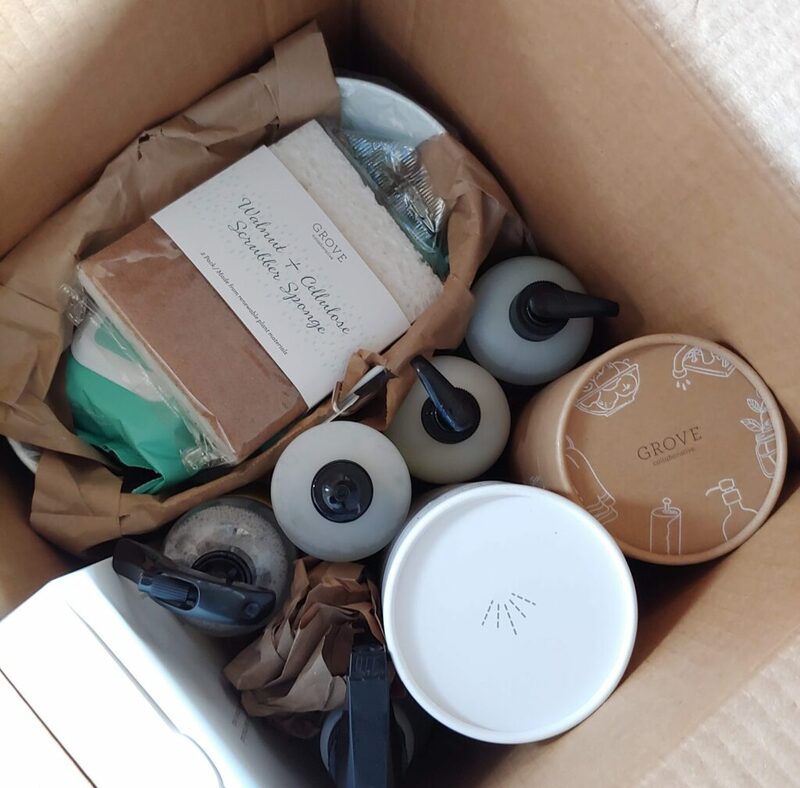 If you’d like to give Grove Collaborative a try, use THIS LINK to get 5 free items with your first order (more free stuff if you order more, like I did), plus free shipping. Let me know what your favorites are in the comments below! 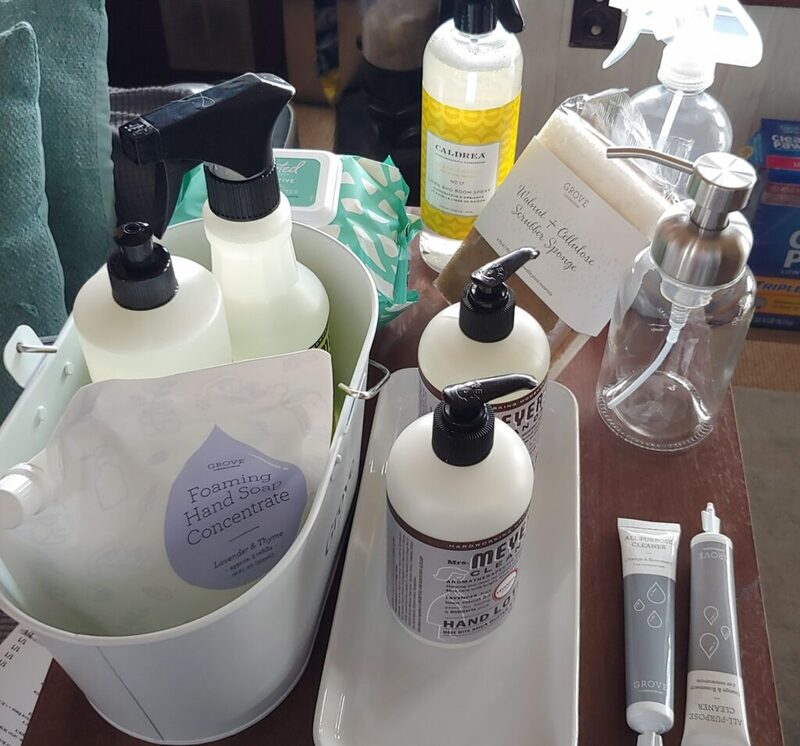 This entry was posted in Boatlife, Essential Oils, Home, Random and tagged cleaning products, cleaning with essential oils, Grove Collaborative, GroveCollaborative by Lori Griffin. Bookmark the permalink. ← Previous Previous post: We are homeschooling!